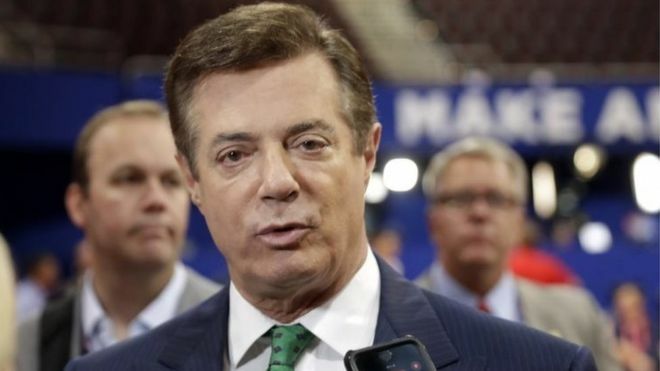 US President Donald Trump's one-time campaign chairman secretly worked for a Russian billionaire to assist President Vladimir Putin, the Associated Press (AP) news agency reports. Paul Manafort is said to have proposed a strategy to nullify anti-Russian opposition across former Soviet republics a decade ago. AP says documents and interviews support its claims about Mr Manafort. Mr Manafort has insisted that he never worked for Russian interests. He worked as Mr Trump's unpaid campaign chairman from March until August last year, including the period during which the flamboyant New York billionaire clinched the Republican nomination. He resigned after AP revealed that he had co-ordinated a secret Washington lobbying operation on behalf of Ukraine's ruling pro-Russian political party until 2014. Newly obtained business records link Mr Manafort more directly to Mr Putin's interests in the region, AP says. It comes as Trump campaign advisers are the subject of an FBI investigation and two congressional inquiries. Investigators are reviewing whether the Trump campaign and its associates co-ordinated with Moscow to interfere in the 2016 presidential election campaign to damage Mr Trump's opponent, Hillary Clinton, a stern critic of Mr Putin. Mr Manafort is said to have pitched the plans to aluminium magnate Oleg Deripaska, a close ally of President Putin. In a confidential strategy plan in 2005, AP reports, Mr Manafort proposed to influence politics, business dealings and news coverage in the US, Europe and the ex-Soviet republics to advance the interests of the Putin government. At this time, US-Russia relations were deteriorating. "We are now of the belief that this model can greatly benefit the Putin government if employed at the correct levels with the appropriate commitment to success,'' Mr Manafort is said to have written, adding that it would be offering "a great service that can refocus, both internally and externally, the policies of the Putin government". Mr Manafort signed a $10m-a-year contract beginning in 2006, AP reports. How much work he did under this contract was unclear. Mr Manafort and Mr Deripaska reportedly maintained a business relationship until at least 2009.